Description: Connect cookies to serve your customers and make them happy. Can you fulfill the hungry bear?s cookie cravings? Dozens of puzzling levels! 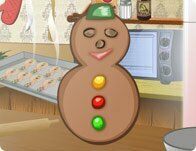 Instructions: Use the mouse to play this Cookie Connect game!